Congress confirmed a former coal lobbyist for the number two position at the Environmental Protection Agency this week. In a party-line vote, the Senate confirmed Andrew Wheeler to be the EPA's deputy administrator. Wheeler is a principal at Faegre Baker Daniels consulting firm and was registered as a lobbyist for companies like Murray Energy in 2017, according to federal lobbying records. Murray Energy's website calls it the largest coal mining company in the country. He also worked at the EPA in the Office of Pollution Prevention during the George H.W. Bush and Bill Clinton administrations, according to an EPA press release, as a staffer for the Senate Environment and Public Works Committee and worked as general counsel for conservative Sen. James Inhofe, R-Ok., who wrote a book about global warming called "The Greatest Hoax." A view of the U.S. Environmental Protection Agency (EPA) headquarters on March 16, 2017 in Washington, D.C.
One of the controversies with Wheeler's nomination has been that connection to Murray Energy's CEO, Bob Murray. Murray has publicly said that climate change is not a problem and that carbon dioxide, which the EPA lists as the primary greenhouse gas, is not a pollutant. In a PBS documentary that aired last October, Murray said he had written the administration an "action plan" to help the coal industry and said that the administration had already "wiped out page one" of his requests. 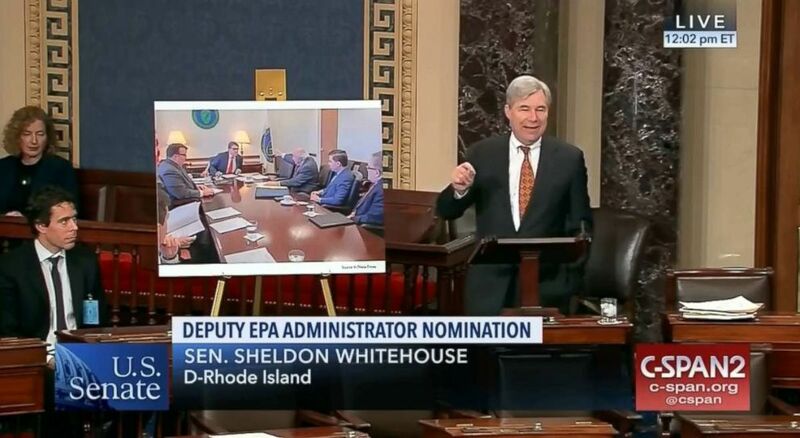 Sen. Sheldon Whitehouse's office obtained a copy of that memo, reviewed by ABC News, which lists 14 policy priorities such as rolling back the Clean Power Plan and withdrawing the finding that forms the basis of the EPA's authority to regulate greenhouse gases. During discussion of Wheeler's nomination on Thursday Whitehouse, D-R.I., showed a picture of a meeting at the Energy Department where Murray met with Secretary Rick Perry. Wheeler is in pictures of that meeting that were leaked by a photographer at the department, who later said he was fired for sharing the photos. Sen. Sheldon Whitehouse speaks during a senate confirmation vote for Andrew Wheeler, April 12, 2018 in Washington, D.C. In his confirmation hearing last November, Wheeler said he was no longer registered as a lobbyist for Murray as of last August. He said he was not part writing that memo or asked to help implement it. Wheeler also said that he would follow the recommendation of the EPA's ethics office in regards to recusing himself from matters at the EPA involving Murray Energy, including the company's pending lawsuits against the agency. "I will be recusing myself from any work where there is a conflict going forward," Wheeler said at the hearing. Some Democratic Senators unsuccessfully called for a delay in the vote Thursday, saying they wanted Wheeler to be vetted more thoroughly because of the controversy around Pruitt and indicated after the vote that Wheeler could be next in line to take over at EPA if Pruitt resigns or is fired by the president. "It's entirely possible Andrew Wheeler could be sworn in as acting administrator before he serves a single day as deputy administrator," the top Democrat on the Senate committee with oversight of EPA, Sen. Tom Carper, D-Del., said Thursday. Whitehouse slammed Wheeler's confirmation in a statement after the vote, saying that a "coal baron lobbyist" was a dangerous choice for a top job at EPA. "Wheeler’s job was helping Murray tear down vital health and safety protections for the American people," Whitehouse said in the statement. Inhofe defended Wheeler on Thursday, saying that he would be a good steward for the environment at EPA and that Democrats are just angry that the Trump administration is backing off strict environmental regulations put in place under President Barack Obama. "The extreme environmentalists were writing the environmental regulations under the Obama administration…and they can’t handle that the American people have said ‘Enough,’" Inhofe said Thursday. This week's vote on Wheeler was even more high-profile because of the swarm of controversy surrounding EPA Administrator Scott Pruitt in recent weeks, including questions about his living arrangement in a Capitol Hill townhouse connected to lobbyists and his spending on travel and security since he took over at the agency. More than 100 members of Congress, including three Republicans, have called for Pruitt to resign and the Republican chairman of the House Oversight Committee has asked the EPA to provide documents on Pruitt's spending decisions and living arrangement to the committee. Pruitt tweeted to congratulate Wheeler and said in a statement he looks forward to working with Wheeler to implement the president's agenda. Let me be the first to congratulate Andrew Wheeler as @EPA's new deputy administrator. Andrew has spent his entire career advancing sound environmental policies & I look forward to working with him to implement President Trump’s environmental agenda. The previous acting deputy administrator, Mike Flynn, who was at EPA for more than 36 years, retired last week. Nine environmental groups, including the Sierra Club and the Natural Resources Defense Council, wrote to senators urging them to vote against Wheeler. Some Democrats said that Wheeler should be vetted more thoroughly in case Pruitt resigns and he ends up taking over at the EPA. The ranking member of the committee that considered his nomination, Sen. Tom Carper, D-Del., said that more questions have been raised about actions at the agency since Wheeler's confirmation hearing. "Andrew Wheeler is well qualified to serve in this critical position at the EPA," Sen. John Barrasso, R-Wyo., said. Another Republican, Sen. Susan Collins of Maine, said she had more confidence in Wheeler than Pruitt to lead the agency. 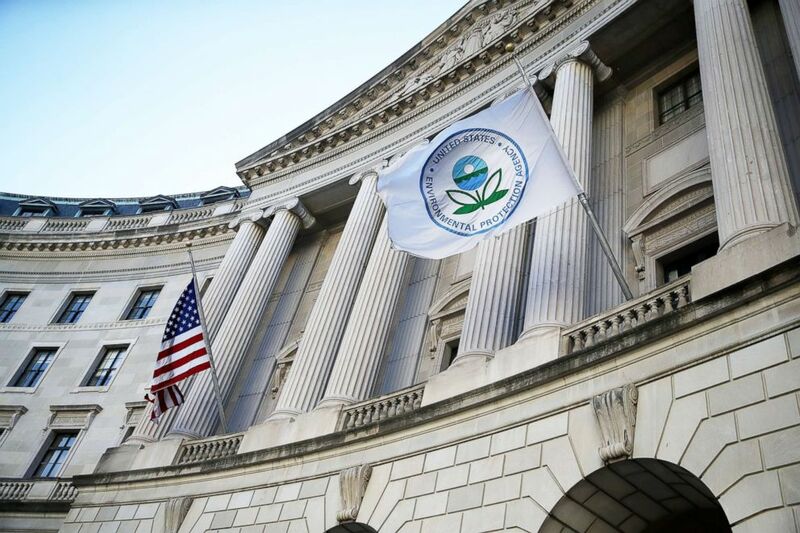 The EPA did not say Thursday when Wheeler will be sworn in.